I guess I'm behind when it comes to the challenge bandwagon...I didn't realize it was important to decide by January 1st that I wanted to do a challenge...one challenge is already closed as of the first of January, sheesh. Thanks to Bloggiesta, I found Kim's blog, Page After Page. She knew about these challenges that one is supposed to be signed up for before the first of January and even had a nice list of ones she is participating in. There are three she joined that I'm excited about so I'm linking up, too. I have to choose 12 books from my TBR list that I'm really going to read! 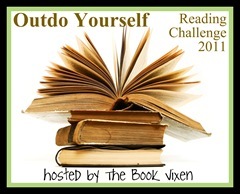 The goal for this challenge is to read more books in 2011 than I read in 2010, which is a goal I set for myself and already shared with my students, so this works out perfectly for me. Now, there are different levels for this challenge and I'm going big (no way am I staying home!). I'm going to do the "I'm on Fire!" level which means I plan to read 16+ more books than I read last year. In 2010, I read 125 books - that's only counting chapter books/novels/professional books not any picture books. The new goal is 141 or more! This challenge is all about stimulating the economy and supporting bookstores while at the same time stimulating reading. There are two levels for this challenge, the first level is buying one book and reading one book. The second level is buying 12 books throughout the year and reading those 12 books. I'm committing to the second level of books. I already know I won't be buying adult books, but I'll definitely buy books I want to read that I can add to my classroom library for my students. I'm creating a 2011 Challenges page and will post my progress there! Anyone else doing these particular challenges or other challenge that are really good? This is my first time doing year-long challenges. Should be fun!